When you were a kid, didn’t you just love to eat raw cookie dough? I used to wish my mom would leave the soft little rolled cookies out of the oven. But she would always tell me I shouldn’t eat raw eggs, and of course, now I don’t eat eggs at all, so no raw cookie dough for me. 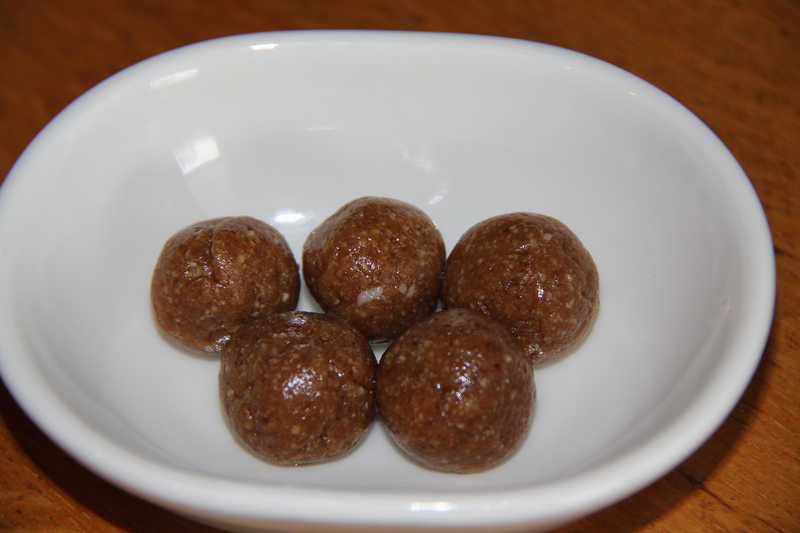 I was experimenting with some ideas to bring over to a friend’s house for dessert and ended up making these little balls that totally taste like raw cookie dough. And they’re healthy too! Three simple ingredients and a food processor and voila! But warning – my dinner friends agree, they are addictive. Place almonds in food processor with low “S” blade and chop until very fine. Add dates and vanilla. Puree in food processor, stopping to scrape dough off sides and back into the blade as needed until mixture is the consistency of cookie dough. Roll into 1 – 2” balls and serve. Makes about 24 1” balls or 12 2” balls. This entry was posted in desserts, Recipes and tagged dessert, gluten-free, healthy, raw, recipe, vegan, vegan cooking, vegan recipes. Bookmark the permalink.